This article is about the business news channel in the United States. For all international CNBC channels, see List of CNBC channels. For other uses, see CNBC (disambiguation). CNBC is an American pay television business news channel that is owned by NBCUniversal Broadcast, Cable, Sports and News, a division of NBCUniversal, with both being ultimately owned by Comcast. 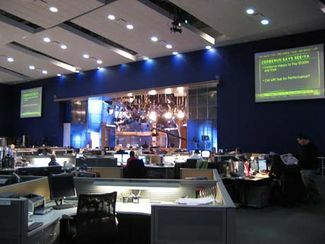 Headquartered in Englewood Cliffs, New Jersey, the network primarily carries business day coverage of U.S. and international financial markets; following the end of the business day and on non-trading days, CNBC primarily carries financial and business-themed documentaries and reality shows. CNBC was originally established on April 17, 1989 as a joint venture between NBC and Cablevision as the Consumer News and Business Channel. Two years later, in 1991, the network acquired its main competitor, the Financial News Network, a move which expanded both its distribution and its workforce. Cablevision subsequently sold its stake to NBC, giving NBC sole ownership. As of February 2015, CNBC is available to approximately 93,623,000 pay television households (80.4% of households with television) in the United States. In 2007, the network was ranked as the 19th most valuable cable channel in the United States, worth roughly $4 billion. In addition to the domestic U.S. feed, various localized versions of CNBC also operate, serving different regions and countries. NBCUniversal is the owner, or a minority stakeholder, in many of these versions. 10 Airport "stores" or "bureaus"
CNBC had its beginnings around 1980 as the Satellite Program Network (SPN), showing a low-budget mix of old movies, instructional and entertainment programs. The channel later changed its name to Tempo Television. After initially signing a letter of intent to acquire Tempo, NBC eventually opted for a deal to lease the channel's transponder in June 1988. On this platform, and under the guidance of Tom Rogers, the channel was relaunched on April 17, 1989 as the Consumer News and Business Channel. NBC and Cablevision initially operated CNBC as a 50-50 joint venture, choosing to headquarter the channel in Fort Lee, New Jersey. However, around this time, FNN encountered serious financial difficulties. After a protracted bidding war with a Dow Jones-Westinghouse Broadcasting consortium (the former's assets would be used to build a rival channel almost two decades later), CNBC acquired FNN for $154.3 million on May 21, 1991 and immediately merged the two operations, hiring around 60 of FNN's 300-strong workforce. The deal increased the distribution of the newly enlarged network to over 40 million homes. Cablevision sold its 50% stake to NBC upon completion of the deal. With the full name "Consumer News and Business Channel" dropped, the network's daytime business programming was branded "CNBC/FNN Daytime," although this was phased out by 1992. Roger Ailes was hired as the new president of CNBC in 1993, tasked by NBC CEO Bob Wright with turning around the struggling network. Under Ailes' leadership from 1993 through 1995, the $400 million network doubled in value, and its revenues tripled. In addition, Ailes oversaw the launch of a 1994 spin-off channel from CNBC, called "America's Talking. "[better source needed] Ailes left CNBC and America's Talking in late 1995 when Microsoft and NBC created a joint venture to reprogram America's Talking as MSNBC. 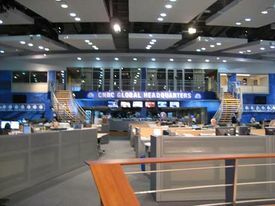 CNBC grew during the 1990s, launching Asian and European versions of the channel in 1995 and 1996 respectively. In 1997, CNBC formed a strategic alliance with Dow Jones, including content sharing with Dow Jones Newswires and The Wall Street Journal and the rebranding of the channel as "a service of NBC Universal and Dow Jones". CNBC's international channels were then merged into a 50-50 joint venture with their Dow Jones-owned rivals, London-based EBN (European Business News) and Singapore-based ABN (Asia Business News) in 1998, while ratings grew on the U.S. channel until the new millennium's dot-com bubble burst in 2000. NBC Universal reacquired full control of loss-making CNBC Europe and CNBC Asia from Dow Jones at the end of 2005. The licensing agreement between Dow and CNBC U.S. remained intact, however. Today, CNBC provides business news programming on weekdays from 4:00 a.m. to 7:00 p.m., Eastern Time, while broadcasting talk shows, investigative reports, documentaries, infomercials, and other programs at all other times. A rolling ticker provides real-time updates on share prices on the NYSE, NASDAQ, and AMEX, as well as market indices, news summaries, and weather updates by NBC meteorologists (prior to March 27, 2006, all of CNBC's weather reports were provided by AccuWeather). A rotating top band of the screen rotates provides real-time updates on index and commodity prices from world markets. On September 17, 2007, the network has also run hourly CNBC.com News Now update segments during business day programming. These short bulletins, which are around 30 seconds in length (similar to ESPN's SportsCenter Right Now), air before the start of the network's programs from Squawk on the Street through The Kudlow Report. The CNBC.com News Now update segments were discontinued as of early 2010. These bulletins were reintroduced in 2015 and were renamed CNBC News Update. They are aired hourly, on the half-hour between 10:30 a.m. and 4:30 p.m. The bulletins are read by Sue Herera. CNBC also produces Nightly Business Report, a 30-minute weeknight business newscast distributed to U.S. public television stations. Launched in 1979, CNBC assumed production of the series in 2013. NBR is hosted by CNBC personalities Sue Herera and Bill Griffeth. On January 24, 2007, the network launched a long-anticipated monthly newsmagazine called Business Nation, which is anchored by award-winning journalist David Faber. Each edition of the program covers three stories; a mixture of profiles, investigative pieces and features. The format of the show is structured similarly to HBO's Real Sports. Other special or weekend programming includes CNBC on Assignment (for example, The Age of Wal-Mart), Cover to Cover, The Suze Orman Show and On the Money. Documentaries featured as part of its CNBC Originals slate have included Marijuana Inc: Inside America's Pot Industry (2009), Trash Inc: The Secret Life of Garbage (2010), Supermarkets Inc: Inside a $500 Billion Money Machine (2011), Customer (Dis)Service (2012), UPS/FedEX: Inside the Package Wars (2012), and Love @ First Byte: The Secret Science of Online Dating (2012). In May 2010, CNBC announced that it would be adding business and financial-themed movies to its Friday night lineup under the name "CNBC Cinema." In the fall of 2011, CNBC began to brand its primetime lineup under the title CNBC Smart. Continuing its focus on documentaries focusing on business, CNBC marketed Smart as "the place where the who's who comes to learn the what's what." Since 2013, CNBC regularly shows one Premier League game at 10:00 ET. On March 5, 2013, CNBC rebranded its primetime lineup once again as CNBC Prime, a move first announced on January 7 of the same year. Hoping to attract a more mainstream audience, the Prime block introduced business-themed reality series to the lineup with the series premieres of The Car Chasers and Treasure Detectives. CNBC planned to launch at least eight new series through the Prime block throughout 2013. Among the original reality programs airing on CNBC Prime include American Greed, Restaurant Startup, Blue Collar Millionaires, Jay Leno's Garage, The Profit, West Texas Investors Club and Secret Lives of the Super Rich. In 2016, CNBC announced two new reality series including Cleveland Hustles and a spin-off of The Profit titled The Partner. In 2018, CNBC announced other new series in development, such as BYOB: Be Your Own Boss, Deadly Rich (a true crime series focusing on the wealthy), Staten Island Hustle, a revival of former NBC game show Deal or No Deal, as well as renewals for American Greed, Jay Leno's Garage, and Secret Lives of the Super Rich. CNBC has experimented with non-business programming during primetime hours with a mixed record of success, including a talk show hosted by Dennis Miller. The channel has at times rebroadcast several NBC programs, including Late Night with Conan O'Brien, Deal or No Deal, The Apprentice, The Apprentice: Martha Stewart, and 1 vs. 100. Until 2017, CNBC participated in USA Network's coverage of the Westminster Kennel Club Dog Show due to conflicts with WWE Raw. CNBC has occasionally served as an overflow outlet for NBC Sports programming; beginning in 2000, CNBC has carried portions of NBC's coverage of the Olympic Games outside of business day hours. The frequent delegation of curling coverage to CNBC during the 2010 Winter Olympics helped the sport gain a cult following among the business community. In 2001, CNBC began a four-year deal to televise events from the Senior PGA Tour, either live or tape delayed, with early-round coverage broadcast on cable feeds of Pax. CNBC president Bill Bolster stated that the decision was meant to help reduce CNBC's reliance on paid programming on weekends. PGA Tour commissioner Tim Finchem also felt that golf and business audiences were "extremely compatible" with each other. Since the 2011-12 season, CNBC has shown coverage of the National Hockey League's Stanley Cup playoffs, produced as part of the NHL on NBC package. CNBC has also participated in NBC's Championship Sunday effort to broadcast all matches on the final day of the Premier League soccer season. In 2016, CNBC broadcast several NASCAR races (as part of the NASCAR on NBC package) due to scheduling conflicts with other NBCUniversal channels during the 2016 Summer Olympics. Until 2017, the channel also aired several Formula One races due to scheduling conflicts on NBCSN; the Formula One rights moved to ESPN beginning in 2018. In 2018, CNBC rebroadcast one match a day during the FIFA World Cup in Russia at 7:00 p.m. ET. Much of CNBC's on-air talent has been with the network for some time: Sue Herera and Scott Cohn joined CNBC at its inception, and remain on the air co-hosting Power Lunch and as senior correspondent respectively. Some personalities who joined CNBC from FNN in 1991, such as Bill Griffeth and Joe Kernen, are also still with the channel. The network has of late sought to increase the profile of its on-air team with the launch of rival business channel Fox Business Network – although CNBC's best known personality, Closing Bell host Maria Bartiromo, made regular appearances on other NBC News broadcasts such as The Today Show and anchored the syndicated Wall Street Journal Report before she left for Fox Business Network. Other CNBC hosts such as Jim Cramer have also been used increasingly across NBC's output. There is a fairly clear long-term correlation between the performance of global stock markets and the audience ratings of CNBC. The network had a difficult time attracting viewers in the first half of the decade, but has seen viewership increase from a 2005 bottom to record highs in 2008, coinciding with the subprime mortgage crisis. CNBC continues to possess the wealthiest audience (in terms of average income) of any television channel in the United States. During the late 1990s and early 2000s, CNBC's ratings were increasing sharply along with the stock market, often beating those of CNN during market hours. In 2000, daytime viewership of the network peaked at 343,000, around the time the Nasdaq Composite crossed 5000. However, when the dot-com bubble began to burst later that year, CNBC's viewing figures declined in tandem. The network's ratings steadily fell quarter after quarter, year after year, until bottoming in Q1 2005, with an average viewership of 134,000 during the day. From the bottom, the network, along with the markets, rebounded significantly – average daytime viewership (6:00 a.m. to 6:00 p.m.) reached a 7-year high of 310,000 viewers in the first quarter of 2008. Coinciding with the extreme market volatility of the ongoing global economic crisis, ratings hit an all-time high of 416,000 in Q3. Although the figures remain considerably less than those achieved by Fox News and CNN today, it has still had a 210% increase in viewership since the beginning of 2005. Despite the viewership slump at the turn of the decade, CNBC has remained extremely profitable: average annual revenues top $510 million while profits for the network exceeded $333 million in 2007, making CNBC a cash cow for NBC Universal and its parent company, Comcast. CNBC is the second most profitable of NBC Universal's thirteen cable channels in the United States, behind only the USA Network. The network often sees large spikes in viewership on days of major market moves. During the week of February 27, 2007, when the Dow Jones Industrial Average had its seventh-largest loss ever, CNBC's continuing coverage of events resulted in its best ratings week since the market crash after the September 11, 2001 terrorist attacks, with Kudlow & Company, Mad Money, and Fast Money recording their best ratings ever in the coveted 25-54 demographic. When the financial crisis wreaked havoc in the worldwide equity markets, CNBC recorded some of the highest ratings in the network's two-decade history. For the week ending September 19, 2008, the network averaged 502,000 viewers during the "business day" (defined by the network as 5 a.m. to 7 p.m.). During this week, Squawk Box, Closing Bell, Fast Money, Mad Money and Kudlow & Company recorded their best viewership figures ever. On September 29, 2008, when the markets faced their worst single session performance since the crash of 1987, CNBC saw its best ratings day ever, with an average 726,000 viewers tuning into the network during the business day. While daytime viewership has rebounded from its 2005 lows, primetime ratings remain weak relative to those of other news networks and CNBC continues to try and rejuvenate its evening lineup. Along with developing new program formats such as Fast Money and Mad Money, the network operates a "checkerboard" programming approach, airing various genres of shows including documentaries, town-hall style discussions and repeats of some NBC output. When discussing the network's ratings, CNBC management and press releases regularly suggest that considerable viewership, particularly during the daytime, is done "out of home" in places such as offices and hotel rooms. As this demographic is not covered by Nielsen ratings, CNBC claims that the network's true viewership is considerably higher than what is measured. On January 6, 2015, the Wall Street Journal reported that CNBC would be partnering with Cogent Research to calculate the viewership of its business day programming by surveying financial advisers and investors. This change will help to provide a more accurate measurement of the network's out-of-home viewership; Nielsen will still be used to track the viewership of its entertainment programming. The CNBC Ticker is a computer simulation of ticker tape shown on the lower part of the screen during the network's live weekday business programming and on weekends during replays of Options Action (a Friday options trader's debate program following Fast Money that airs from 5:30 p.m. to 6:00 p.m. ET, with the same crew as Fast Money), from 6:00 a.m. to 6:30 a.m. ET (albeit with the ticker hidden during the commercial breaks), containing security and index symbols along with movements in their value, updated every 20 minutes, despite being advertised as "Real-Time". At the right of the screen above the ticker, three vertically stacked "flippers", provides index and commodity prices (although during commercial breaks, the flippers relocate to the top of the ticker in a horizontal fashion to make room for the commercials themselves, which in turn, grow to four, except during the 30 minutes to the opening and closing bells, and during trading, where a bigger rectangular box, covering part of the ticker, usually shows the current trading status for the Dow Jones Industrial Average, and the fourth flipper is replaced by the CNBC bug with the current time of the six different time zones). On weekdays, the flippers are hidden during the commercial break leading to, and including the last segment of Fast Money and throughout Mad Money, as the latter show uses different graphics which cover up the space (the three flippers however, remain in the right atop the ticker during weekend 6 am ET replays of Options Action). The music used from October 2003 to December 2005 was produced by 615 Music of Nashville, Tennessee. This music (though only edited versions of the arrangements for Street Signs and Closing Bell) continues as of February 2009 to be used by CNBC Europe, although CNBC Asia ceased using it in March 2007. CNBC Europe continued also to use "CNBC Anthem" (a.k.a. "Bold & Grand"), which was composed by Edd Kalehoff and used by CNBC U.S. between 2000 and 2002. For its main channel ident used until a relaunch on September 30, 2008, the anthem was remixed, adding the NBC chimes to the music. However, it is still used for its "Europe Update" segments during U.S. programming. The current music package is composed by James Ryan of Rampage Music New York, a company that has also created music for co-owned WNBC, also in New York City. Ryan also composed the network's 2002 music package. Willie Wilcox composed the themes for The Big Idea, Mad Money, Conversations with Michael Eisner and currently Fast Money. 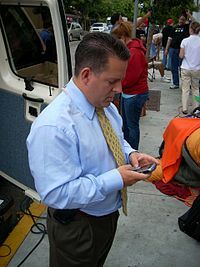 CNBC's main voice-over announcer during business-day programming is Jim Birdsall, who also works for NFL Films, and was the narrator in the commercials for pizza chain CiCi's Pizza. In addition, Birdsall is the main station announcer for KING-TV, the Tegna-owned NBC affiliate station in Seattle. The signature voice for CNBC Prime is Brian Lee. Lee also covers business-day announcer duties when Birdsall is absent. The voice-over announcer for CNBC Europe is UK Based, Philip Banks. The graphics are designed by Sweden-based Magoo 3D studios. Since December 1997, the network has held a strategic alliance with the publishing and financial information firm Dow Jones & Company. Under the agreement, CNBC has extensive access to the journalism of such outlets as MarketWatch, The Wall Street Journal, Dow Jones Newswires and Barron's, with their reporters and editorial staff making frequent appearances on the channel. 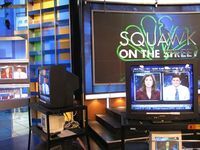 Some former CNBC programs have included Dow Jones branding, while the network currently produces and syndicates the weekly Wall Street Journal Report with Maria Bartiromo. CNBC's current deal with Dow Jones expired in 2012, and its continuation has been the subject of some uncertainty following the 2007 acquisition of Dow by News Corporation, parent company of rival financial network Fox Business until the channel was spun off to 21st Century Fox in 2013, which had been started just two months prior and whose resources have been used to build up Fox Business. News Corporation CEO Rupert Murdoch has stated that the current agreement "covers actual news and access to reporters on business news" only, and that Fox and Dow Jones are free to cooperate on other issues. CNBC has also held a content deal with The New York Times since January 2008, which has widely been seen as an attempt by both parties to take on increased competition from News Corporation. Under the agreement, CNBC has access to the business coverage of the Times, while video from CNBC.com is featured on the Times' website. The station's video clips and other content are also distributed through Yahoo! Finance and, as of May 2008, AOL Money & Finance. The network's live market prices, economic data and other statistics are largely provided by Thomson Reuters (Reuters and Thomson Financial prior to their 2008 merger). Since September 2006, CNBC has operated its own stock market index in conjunction with London's FTSE Group. The FTSE CNBC Global 300 includes the fifteen largest companies from each of the sectors of the Industry Classification Benchmark as well as the thirty largest companies from emerging markets. Calculated continuously from 9 p.m. through to 4:10 p.m. ET each trading day, the index is referenced throughout the network's live programming, particularly on Worldwide Exchange. The channel also maintains the "CNBC Investor Network", a series of webcam connections to the trading rooms of various independent financial institutions across the United States. The scheme was launched on October 22, 2007 and allows participating traders and strategists to appear on the network during the business day. On December 14, 2010, CNBC and CarryQuote announced a development and marketing collaboration that resulted in the release of CNBC PRO, a mobile and desktop financial application for individual investors. CNBC PRO provides its subscribers with real-time financial data from more than 100 stock exchanges worldwide, plus CNBC news and streaming video. CNBC has operated international versions of the channel since 1995, when CNBC Asia originally launched. CNBC Europe followed in 1996. On December 9, 1997, Dow Jones & Company and NBC announced the merger of their international business news channels. This resulted in a merger of CNBC Europe with Dow Jones' European Business News, and likewise of CNBC Asia with Asia Business News. From then (until January 2006) the international CNBC services carried the tagline "A Service of NBC (Universal) and Dow Jones" (or depending on other local partners, a variation of this tagline). Correspondents from Dow Jones Newswires contribute to the channels. On December 31, 2005, the sale by Dow Jones of its interests in the international CNBC channels took effect. On January 1, 2006, the "A Service of NBC Universal and Dow Jones" tagline was removed from the international CNBC channels, in line with this. In 2007, CNBC Asia dropped the word "Asia" from its channel idents, on September 30, 2008, CNBC Europe similarly dropped the word "Europe" from its logo. This means the three major CNBC channels – U.S., Europe, and Asia – are all known on-screen as simply CNBC. 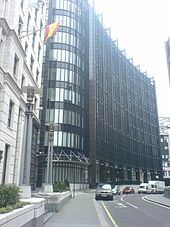 CNBC Europe is headquartered in London, and CNBC Asia is headquartered in Singapore. In Canada, CNBC can be seen with most of the programming identical to the U.S. counterpart. However, due to Canadian programming rights, the 9:00 p.m. slot which had shown television programming in the past such as Deal or No Deal, The Apprentice, 1 vs. 100 and Heads Up Poker, as well as any and all Olympic Games coverage that the channel continues to carry, are replaced by CNBC World programming. However, documentaries are shown in Canada. This had the making of a major problem, as a highlight episode of The Apprentice 5 that aired April 23, 2006, was assumed to not be available anywhere for Canadians due to these blackouts. While the first airing at 9:00 p.m. ET was blacked out, the second airing at midnight ET was accidentally shown. Blackouts on episodes that originally air on NBC and Global are likely to continue. However, occasionally, the television shows are shown and are not blacked out, possibly due to a mistake in transmission. CNBC Africa was launched on June 1, 2007. With roughly $600 million spent on advertising in South Africa alone, the network sees great potential in grabbing a potential share of that pot. It has bureaus in Kenya, Nigeria and South Africa and produces nine hours of local programming per business day. The launch of the Korean language channel SBS-CNBC in January 2010 marked the fifteenth CNBC-branded channel worldwide. On January 10, 2016, CNBC and Trans Media announced a strategic partnership that will see the creation of the Indonesian language channel CNBC Indonesia. During this period, the editorial content on the CNBC.com site was controlled by Microsoft Corporation. CNBC.com officially ended its relationship with MSN in mid-November 2006. Content on the new website is edited 24 hours a day during the business week. CNBC U.S. updates the content from 6:00 a.m. to 7:00 p.m. ET, CNBC Asia then takes over from 7:00 p.m. to 2:00 a.m., and CNBC Europe handles the remaining four hours. In August 2012, CNBC.com attracted 6.9 million unique visitors, according to comScore Media Metrix. Its iPad app recorded 547,000 unique visitors and its iPhone app attracted 551,000 unique visitors. "CNBCplus" was a subscription-based service (similar to the now-defunct CNN Pipeline) which allowed users to have 24-hour, commercial-free access to three individual CNBC feeds – CNBC U.S., CNBC Europe and CNBC Asia – along with access to an archive of over 100,000 VOD clips, updated with up to 200 clips daily. It also offered a search feature allowing the user to find video clips using keywords. The CNBCplus service was replaced by CNBC PRO. On December 14, 2010, CNBC and CarryQuote announced a development and marketing collaboration that resulted in the release of CNBC PRO, a mobile and desktop financial application for individual investors. CNBC Pro provides its subscribers with real-time financial data from more than 100 stock exchanges worldwide, plus CNBC news and streaming video. For the introductory price of $24.99 per month, or $269 per year, a user can access this information from his or her computer or BlackBerry, with access from iPhone, iPad, and Android to follow in 2011. In December 2010, CNBC migrated its 16,000 users of CNBCplus to CNBC PRO. CNBC launched "Make It" as a vertical of CNBC.com in 2016 to capture millennial audience with articles focused on work, life, money and success. Make It features stories from successful millennial and provides advice on personal finance and money management with youth in focus. With the growth of "Make It" vertical, it became highest readership holder on CNBC.com. In 2019, "CNBC Make It" was launched as a separate site with its own unique design. DirecTV was the first provider to introduce CNBC HD, with various others eventually taking suit (all of the providers have the HD feed as of the Oct. 13, 2014 redesign). CNBC has been criticized for allegedly amplifying bull and bear markets, particularly in the run-up to the Dot-com bubble and the subprime crisis. In response to these criticisms, CNBC anchors have pointed to the size of the market and noted that influencing it is "a little out of our reach." Jon Stewart on Comedy Central's The Daily Show has been a vocal critic of CNBC and some of its personalities, beginning after comments were made by Rick Santelli. Despite the lack of direct comments by the network, several personalities have defended their predictions and comments. CNBC was accused by the Obama administration of "cable chatter"—the excessive and sometimes brutal discussion on a particular topic, often one-sided. Jim Cramer's stock picks on his CNBC show Mad Money were found by Barron's magazine in 2007 to have underperformed the S&P 500 stock index over the previous two years. Barron's stated that "his picks haven't beaten the market. Over the past two years, viewers holding Cramer's stocks would be up 12% while the Dow rose 22% and the S&P 500 16%." CNBC disputed the magazine's findings. ^ [dead link] "Contact Us Archived August 27, 2008, at the Wayback Machine." NBC Universal. Retrieved on August 28, 2009. ^ "The Media Business; New CNBC President". The New York Times. July 27, 1990. Retrieved July 16, 2007. ^ Seidman, Robert (February 22, 2015). "List of how many homes each cable network is in as of February 2015". TV by the Numbers. Zap2it. Retrieved March 10, 2015. ^ Garofoli, Joe (October 14, 2007). "Fox Business Network gets ready to battle CNBC". San Francisco Chronicle. Retrieved October 14, 2007. ^ "CNBC Preps Launch in South Korea". Adweek. October 22, 2009. Retrieved October 22, 2009. ^ a b "CNBC Launch 24-hour Korean Language Business News Channel, SBS-CNBC" (Press release). Seoul: CNBC. January 20, 2010. Retrieved August 16, 2018. ^ "The Media Business; NBC to Buy Cable Service". The New York Times. May 3, 1988. Retrieved July 16, 2007. ^ Boyer, Peter J. (June 10, 1988). "The Media Business; NBC Cable Deal Is Off, But Lease Accord Is Set". The New York Times. Retrieved October 19, 2007. ^ Carter, Bill (April 10, 1989). "The Media Business: Television; NBC Walks Into a Cable Minefield". The New York Times. Retrieved October 19, 2007. ^ a b Fabrikant, Geraldine (February 27, 1991). "The Media Business; Surprise Pact By G.E. Unit To Buy FNN". The New York Times. Retrieved October 19, 2007. ^ a b "Purchase Of Fnn Boosts NBC's Cable-Market Share". The Seattle Times. Associated Press. May 26, 1991. Retrieved July 21, 2008. ^ Guy, Pat (February 27, 1991). "NBC Wins FNN; Dow Jones Jilted". USA Today. Retrieved October 19, 2007. ^ "Annual Report 1995: Business Review: NBC". General Electric. Archived from the original on June 12, 2007. Retrieved July 16, 2007. ^ a b c "NBC And Dow Jones To Form Global Business Television And Internet Alliance" (Press release). NBC, Dow Jones & Company. December 9, 1997. Retrieved March 29, 2008. ^ "Form 10-K submitted by Dow Jones & Company for the fiscal year ended December 31, 1997". Dow Jones & Company, United States Securities and Exchange Commission. March 17, 1998. Retrieved July 16, 2007. ^ Brady, Ray (June 2003). "CNBC Fell from Grace When the Bubble Burst. How Does It Look Now?". Columbia Journalism Review. Retrieved July 21, 2008. ^ Loades-Carter, Jonathan (July 21, 2005). "Dow Jones pulls out of joint venture with CNBC". Financial Times. Archived from the original on June 15, 2009. Retrieved November 28, 2007. ^ "CNBC TV Schedule" (Press release). CNBC. November 25, 2007. Retrieved November 5, 2007. ^ "CNBC looking to distinguish itself". USA Today. October 30, 2006. Retrieved July 16, 2007. ^ "News Headlines". Cnbc.com. December 17, 2008. Retrieved July 11, 2012. ^ "News Headlines". Cnbc.com. January 3, 2011. Retrieved July 11, 2012. ^ "News Headlines". Cnbc.com. January 23, 2012. Retrieved July 11, 2012. ^ "News Headlines". Cnbc.com. January 31, 2012. Retrieved July 11, 2012. ^ "CNBC Making Major Pitch For 'CNBC Smart' Block". TVNewser. Retrieved May 1, 2013. ^ "CNBC Prime: A New Look, New Attitude, New Reality". CNBC. January 7, 2013. Retrieved April 8, 2017. ^ "Inside CNBC Prime, CNBC's New Primetime Entertainment Block". TVNewser. MediaBistro. Retrieved April 3, 2013. ^ Marotti, Ally (January 14, 2016). "Marcus Lemonis announces new CNBC show 'The Partner'". Chicago Tribune. Retrieved January 15, 2016. ^ "CNBC unveils primetime line-up". C21media. Retrieved March 14, 2018. ^ "CNBC reboots Deal or No Deal". C21media. Retrieved March 14, 2018. ^ Petski, Denise (March 13, 2018). "CNBC Greenlights 'Deal Or No Deal' Reboot With Howie Mandel". Deadline. Retrieved March 14, 2018. ^ "Westminster Kennel's Dog Show Leaves NBCU's USA for Fox Sports". Variety. Retrieved November 11, 2015. ^ a b "CNBC drives Senior PGA b'cast deal". Variety. Retrieved November 11, 2015. ^ "On Wall Street, a Romance With Curling". The New York Times. Retrieved November 11, 2015. ^ "NBC deal raises NHL's game". Variety. Retrieved November 11, 2015. ^ "NBCUNIVERSAL PRESENTS UNPRECEDENTED COVERAGE OF PREMIER LEAGUE'S "CHAMPIONSHIP SUNDAY" ON MAY 11" (Press release). NBC Sports Group. April 17, 2014. Retrieved April 19, 2014. ^ "Sue Herera". CNBC. Retrieved November 14, 2007. ^ "Scott Cohn". CNBC. Retrieved November 14, 2007. ^ "Joe Kernen". CNBC. Retrieved November 14, 2007. ^ "Bill Griffeth". CNBC. Retrieved November 14, 2007. ^ Wighton, David (May 12, 2006). "Lunch with the FT: She's the One". Financial Times. Retrieved November 14, 2007. ^ Friedman, Jon (August 9, 2006). "CNBC's Maria Bartiromo Outgrows the 'Money Honey' Label". MarketWatch. Retrieved November 14, 2007. ^ "Conflict in Plane Sight". Broadcasting & Cable. February 5, 2007. Retrieved November 14, 2007. ^ a b c d Hempel, Jessi (March 31, 2008). "CNBC Feels Your Pain..." Fortune. Archived from the original on April 9, 2008. Retrieved March 31, 2008. ^ Fishman, Charles (May 2000). "The Revolution Will Be Televised (on CNBC)". Fast Company. Retrieved July 17, 2007. ^ Topcik, Joel (September 18, 2006). "Wald Boosts Business at CNBC". Broadcasting & Cable. Retrieved July 17, 2007. ^ Learmonth, Michael (February 7, 2005). "CNBC on a Road Bound for Revamps". Variety. Retrieved October 19, 2007. ^ "Sep'08 P2+ Weekday Ranker" (PDF). TV Newser. October 2, 2008. Archived from the original (PDF) on October 28, 2008. Retrieved October 25, 2008. ^ Robins, J. Maz (September 25, 2006). "A Modified MSNBC?". Broadcasting & Cable. Retrieved July 17, 2007. ^ "Video: CNBC's Market Plunge Coverage". YouTube. February 27, 2007. Retrieved July 17, 2007. ^ "Market Selloff: CNBC's Best Week Since '01". TV Newser. March 6, 2007. Archived from the original on September 30, 2007. Retrieved July 17, 2007. ^ "Zucker Drops By on CNBC's Best Week Ever". TV Newser. September 17, 2008. Archived from the original on May 20, 2010. Retrieved September 17, 2008. ^ "CNBC's Best Day Ever". TV Newser. October 1, 2008. Archived from the original on December 4, 2008. Retrieved October 1, 2008. ^ "1Q'08 P2+ Weekday Ranker" (PDF). TV Newser. April 1, 2008. Archived from the original (PDF) on May 28, 2008. Retrieved May 21, 2008. ^ Greppi, Micehle (October 7, 2007). "Q&A: CNBC President Mark Hoffman". TelevisionWeek. Archived from the original on October 11, 2007. Retrieved October 19, 2007. ^ "CNBC to Stop Using Nielsen for Ratings". The Wall Street Journal. January 6, 2014. Retrieved January 7, 2015. ^ T-RackS. "Willie Wilcox". Archived from the original on September 30, 2007. Retrieved July 17, 2007. ^ "The voice of CNBC, live!". CNBC. April 17, 2014. Retrieved April 22, 2017. ^ "The Wall Street Journal Report with Maria Bartiromo". CNBC. Archived from the original on May 16, 2008. Retrieved March 29, 2008. ^ a b Hau, Louis (August 8, 2007). "Murdoch Plots Course For Dow Jones". Forbes. Retrieved March 29, 2008. ^ a b "CNBC and The New York Times make content deal". International Herald Tribune. Associated Press. January 7, 2008. Retrieved March 31, 2008. ^ Sweney, Mark (January 8, 2008). "New York Times and CNBC in alliance". guardian.co.uk. London. Retrieved March 31, 2008. ^ Stelter, Brian (December 12, 2007). "Yahoo Deal Adds Content From CNBC". The New York Times. Retrieved March 31, 2008. ^ Crum, Rex (May 20, 2008). "AOL announces new content deal with CNBC". MarketWatch. Retrieved May 21, 2008. ^ a b c "FTSE and CNBC Team up to create FTSE CNBC Global 300 Index" (Press release). CNBC Europe. September 18, 2006. Retrieved March 31, 2008. ^ "CNBC Sets Up Trading Floor Webcams". TV Newser. October 22, 2007. Archived from the original on May 10, 2009. Retrieved March 31, 2008. ^ a b Lieberman, David (December 14, 2010). "CNBC to launch CNBC Pro trading service with real-time info". USA Today. Retrieved December 17, 2010. ^ a b Roush, Chris (December 14, 2010). "Assessing CNBC Pro". Talking Biz News. Archived from the original on December 19, 2010. Retrieved December 30, 2010. ^ Pfanner, Eric (October 1, 2006). "CNBC pushes hard to fend off rival Fox". International Herald Tribune. Retrieved July 17, 2007. ^ "CNBC and PT Trans Media Corpora announce Indonesia Partnership". CNBC.com. January 10, 2016. Retrieved July 4, 2016. ^ "Is MSN Money the Same as Microsoft Money?". AZ Central. December 5, 2006. ^ "CNBC redesigns its Web site". International Herald Tribune. December 4, 2006. Retrieved July 17, 2007. ^ CNBC.com, CNBC.com. "America's Top States for Business". CNBC.com. CNBC.com. Retrieved November 12, 2012. ^ CNBC.com, CNBC.com. "Fiscal Cliff: America's Looming Economic Crisis". CNBC.com. CNBC.com. Retrieved November 12, 2012. ^ Roush, Chris (September 15, 2012). "CNBC.com sees drop in August readers". ^ CNBC. "CNBC Plus". Archived from the original on July 6, 2007. Retrieved July 16, 2007. ^ "CNBC launches market data tool". Finextra. December 15, 2010. Retrieved December 20, 2010. ^ "Here's How I Become a Digital Editor at CNBC.com". www.themuse.com. August 29, 2018. Retrieved January 22, 2019. ^ "About Make It". www.cnbc.com. November 28, 2018. Retrieved January 22, 2019. ^ Dickson, Glen (September 17, 2007). "CNBC To Throw HD Switch". Broadcasting & Cable. Retrieved September 17, 2007. ^ a b "Paradies - Brand Detail". Archived from the original on May 21, 2011. Retrieved June 21, 2018. ^ Airport Opens Gift Shop; Construction To Begin On CNBC Store, McAllen.net (City of McAllen website), July 22, 2010. Retrieved February 5, 2011. ^ McAllen Airport Announces Opening Of CNBC Store, McAllen.net (City of McAllen website), October 18, 2010. Retrieved February 5, 2011. ^ a b Rutenberg, Jim (March 26, 2009). "Media; CNBC Suffers Slings and Arrows of Market's Slide". nytimes.com. Retrieved March 12, 2009. ^ Stelter, Brian (March 8, 2009). "CNBC Thrives as Hosts Deliver News With Attitude". nytimes.com. Retrieved March 12, 2009. ^ Santelli, Rick (February 22, 2009). "Rick Santelli's Shout Heard 'Round the World". cnbc.com. Retrieved February 22, 2009. ^ "CNBC Financial Advice". thedailyshow.com. March 4, 2009. Retrieved May 6, 2009. ^ Gold, Matea (March 11, 2009). "Economy not small issue in deepening Stewart-CNBC feud". nwherald.com. Retrieved March 12, 2009. ^ Santelli, Rick (March 2, 2009). "Rick Santelli: I Want to Set the Record Straight". cnbc.com. Retrieved March 3, 2009. ^ "Another Swipe From Obama At "Cable Chatter"". cbsnews.com. February 23, 2009. ^ Alpert, Bill (August 21, 2007). "Shorting Cramer". barrons.com. 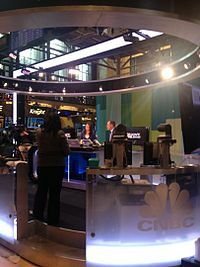 Wikimedia Commons has media related to CNBC. This page was last edited on 20 April 2019, at 07:07 (UTC).